Two years ago a bill was introduced in California that would have grave consequences for off-roaders. Reauthorization of the state off-road program was hijacked by environmentalists. 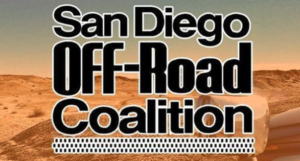 SDORC, along with our lobbyist and partner organizations ASA and CORVA, fought and amended the bill SB 249 until it was good for off-roaders. This year’s legislative bill introduction deadline has just passed and while there is no looming destruction of our program, there are bills of interest to us we will be watching, supporting and fighting. AB 172 introduced by east San Diego’s own Randy Voepel would raise the maximum speed limit of cars and trucks pulling trailers to 65 MPH. We feel that slower vehicles on an otherwise fast freeway can cause more safety problems than they solve. It certainly wouldn’t hurt to get to the desert a little quicker. AB 867 would require the DMV to accept credit cards as payment for any fees at all of its field offices. The bill would also require the department to allow annual vehicle registration fees to be paid in monthly, bimonthly, or semiannual installment payments. It’s hard to believe we need a legislative bill to direct the DMV to accept credit cards. Speaking of the DMV, AB 1101 would direct the DMV to establish procedures that ensure a person who is requesting services relating to registration of vessels or vehicles, or who is applying for an original or renewal of a driver’s license or identification card, will not be required under normal circumstances to wait in any one line for service longer than one-half hour. I personally love this bill and expect to support it all year. AB 209 would have state parks create a grant program that would provide funding to underserved and at-risk populations to participate in outdoor activities. This could help a program called National Youth Program Using Minibikes (NYPUM). AB 1067 would require the Director of Parks and Recreation, no later than January 1, 2023, to develop and implement a wildfire management plan for state parks, including State Vehicular Recreation Areas. We don’t want our areas to burn up (think Hungry Valley, Carnegie and Hollister Hills). SB 402 would continue to fund an ongoing project in the Inyo National Forest to link routes between BLM and forest land. AB 210 would move the manufacture date of vehicles exempt from smog tests from 1976 to 1982. While we will work on these bills this year and follow a few more that may interest us, SB 767 will be our highest priority. Last year, CORVA entered a lawsuit against all the National Forests to repeal or modify the Travel Management rule. CORVA and the Sierra Access Coalition wrote the language and invited a number of other organizations from around the country to join. One of the organizations was the San Diego Gem and Mineral Society. So I made an appearance at one of their recent meetings to meet some new friends who are interested in keeping public land open. I offered to talk about the lawsuit, but they were far more interested in talking about the recent events in Quartzite Arizona and all the treasures they found. It’s good to know we share a common desire to keep public land open. I was surprised to find out our own Nicole’s parents are regulars at the Gem and Mineral Society. Desert Safari took place, despite the strong winds. The next day they hosted a cleanup of the area and at that Justin and Bo from Tierra Del Sol club presented Friends of Ocotillo Wells with a check for $1000 to help with their work supporting the park’s interpretive program. The 15th annual Lost Lizard Fun Run is coming November 9. This year we have an all-star cast putting it together with Audrey, Nicole and Kathleen doing the planning. We will be going out soon to work on what will be the best route yet. Mark your calendars and make this event your first trip of the season. OHV grants are now available for comment through May 6. I encourage those of you who care about areas to read and comment on the grants (Ocotillo Wells doesn’t get grants). I looked at the Cleveland National forest, Imperial County Sheriffs, BLM El Centro and NUPUM. These all look pretty normal, but in the next month or two I will discuss all the oddball requests for our green sticker dollars. SDORC and friends on Dave Stall show on KUSI! UPDATE: Johnson Valley Shared Use Area will NOT close in August! General Election Tuesday, Nov. 6! Help Save Carnegie State Vehicular Recreation Area!